Having read and finished The Host novel only days before seeing the film, I was eagerly anticipating the release of this adaptation. Despite enjoying the novel, however, The Host is my biggest disappointment of 2013 so far. Let’s put aside the fact that the novel is written by the author of Twilight for a second, because the only thing that these stories have in common is a potential love triangle that once again gets in the way. For one thing, The Host is much better written. The book itself isn’t particularly brilliant, but it is an enjoyable read as the story is well-developed and it explores its sci-fi genre excellently. What makes the book so original is the detail given about the number of futuristic worlds that Wanderer has lived on. There are some brilliant chapters that describe her experiences as she has lived on many different worlds, ones that are made from water, ice, and fire which would have been amazing to see on-screen. But whilst the film adaptation sticks quite closely to the book, for the most part, it is these descriptions and the exploration of these different planets that it completely misses out, meaning that we are left with only a poorly developed romance that lacks any decent sci-fi. The only major downside of the book is the lack of threat and acts/desire for revolution. The souls are friendly and peaceful beings which means that the story lacks any real action, and the humans are too compassionate to want to fight back in any impacting way. It’s a typical flaw in Meyer’s writing as she seems incapable of putting her characters in any real danger. Because of this, The Host once again gets all too caught up on love to have the impact that a book like this needs. Whilst I did like the book, it was this lack of action against the Souls that meant I couldn’t love it, as nothing extreme happens or is built up to, despite how thick the book is. On its own, the film doesn’t work at all. It’s not that The Host is an unadaptable story because it could have been done brilliantly, and I had high hopes with it being adapted by Andrew Niccol. In Time wasn’t the greatest of films but the dystopian future was set up brilliantly, and everybody loves The Truman Show. Having written about two alternative worlds already, it was easy to assume that Niccol could have handled the screenplay for this effortlessly. Alas, he put his focus in all the wrong places and created something that lacked imagination. The adaptation, instead, feels very immature and even awkward. With potential sequels being discussed, as well, the film had the chance to introduce compelling characters that a younger audience could have invested in. Unfortunately, I’m not sure even these naive minds will be hoping for more. Overall, the major scenes from the book are adapted quite well. The film does most of what the book sets out to do, but its biggest flaw is that this futuristic world isn’t given enough explanation. Whilst the film begins well by opening with a narrative that explains how and why this has happened to our planet, it never expands past these first few seconds. The book may lack any action, but what it does do right is fill the dialogue with Wanda’s experiences, detailing her previous lives on other planets to give some background information about why the Souls invade these planets at all. In the film, however, none of this is discussed. Seeing these different worlds would not only have been a visual treat, but it would have made the dystopian future believable. Instead, it all comes off as rather pathetic, especially with its diverted focus on “love conquering all”. The film also misses out a few scenes which would have brought us closer to the characters involved, missing out a character named Walter whose death has a big impact on Wanda, as well as the friendships she makes in the caves with the Doc, especially, taking a back seat. Instead of playing on the novel’s strengths, the film was more of a bullet point list of the main events, never expanding on anything to give it any meaning. The worst example of this was the end of the film, when Wanda wanted to kill herself to give Melanie’s body back and give Earth a chance of fighting back, not wanting to return to another planet because she couldn’t bear being without the people she had begun to care about, something she had never experienced before. This may have been easy to pick up from some of the dialogue, but it was also made to seem irrelevant, much like many of the events that happened beforehand. In the end, and a lengthy 125 minutes later, even less happened in the film than it did in the book. 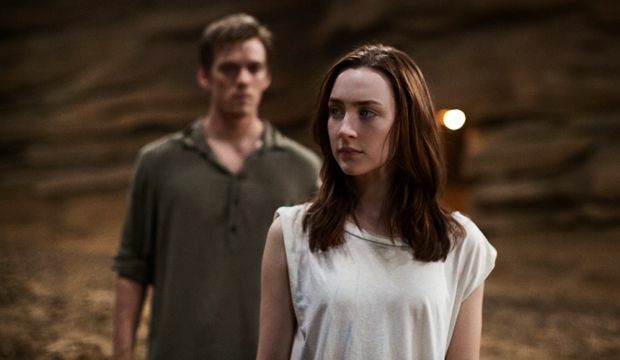 Without the action that it needed to be a good science fiction film, The Host, instead, was more of a love drama, and a bad one at that. Unlike Twilight, which put a heavy focus on the leading relationships, the chemistries between Melanie/Wanda and Jared and Ian here were more or less non-existent. Despite how often the characters pleaded their undying love, there was no apparent reason for them to have any genuine connections, therefore leaving the emotional scenes to constantly fall flat, instead of being the acts of love that were needed to spark a revolution. The reason I was interested in this film at all was because of Saoirse Ronan in the lead role. She’s one of my favourite young actresses and is incredible in films such as Hanna, Atonement, and The Lovely Bones, but not even she could have saved this. Whilst her performance made it slightly more bearable, it wasn’t a role that I enjoyed. She did well with what she was given, but the script was silly and the voice-over came across as cringy. If this was dealt with better, then Ronan may have made this film better than it was. Instead, I found myself sighing every time the voice in her head had something to say, so I couldn’t even come away proclaiming my own undying love for her. The book begins with a prologue that details a Soul being inserted into a human, which turns out to be Melanie. The film starts with a narration explaining how the world has been taken over. In the film, we then see Melanie’s capture before they insert Wanderer into her. In the book, Wanderer sees this memory when she wakes up. In the book, Wanderer overhears a conversation about what has happened to the world between the Seeker and the Healer. In the film, the Seeker explains all of this to Wanderer in an interview room. In the film, the Seeker tells Wanderer that she has to go through her memories so that they can figure out where the resistance is hiding. In the book, Wanderer goes through her memories on her own so that she can figure things out for herself. She then emails the Seeker about what she has found out. In the film, all conversations are in person. In the book, the Seeker talks about a Soul named Racing Song. This isn’t in the film. In the book, the Seeker explains that Melanie was going to meet her cousin, Sharon. Sharon isn’t in the film. In the book, Wanderer has meetings with Kathy, a type of therapist. She tells Wanderer that she needs to make friends and says that they might find Jared, insert a soul into him, and then they can be together. She was also one of the first aliens to arrive on Earth and had to pretend to be her host for several years so that humans wouldn’t know that the souls had arrived. These meetings and conversations aren’t in the film and Kathy isn’t mentioned at all. In the book, Wanderer is more confused about what feelings are hers and what are Melanie’s. In the film, Wanderer seems more concerned with the “strong physical drive” as she often dreams about Melanie and Jared kissing. In the book, Wanderer gives lectures to students about her experiences on other worlds. This is where we learn about the planet made of fire. The film never details any of these other worlds. In the film, Melanie forces the pen out of Wanderer’s hand and later forces her body to do other things. She cannot do this in the book. In the book, the Seeker says that she has been given clearance to take over Melanie’s body. In the film, the Seeker is more forceful which causes Melanie to force Wanderer to lash out. In the film, Melanie persuades Wanderer to escape by jumping off the roof into a pool and to then steal a car. In the book, Wanderer makes the decision herself to go and see her Healer and no escape plan or stolen car is needed. In the book, Melanie shows Wanderer her memories and makes her cry. That’s when she decides that she won’t share her memories and to go along with Melanie’s plan. In the film, there isn’t any crying and Melanie shows her memories to distract her from where she is driving. In the book, Wanderer stocks up on water and pushes the car into a ditch. In the film, Melanie causes the car to crash and they have no supplies. In the book, they go to Jared’s cabin and get more supplies on the way. They don’t do this in the film, either. In the book, Wanderer is introduced to the Doc early on. He wants to take her away but Jared doesn’t let him. In the film, she doesn’t meet the Doc until later on. In the book, Jeb says, “Whoever the body belongs to gets to make the call.” The film thankfully misses out on these awful sexist remarks. In the book, Jamie is waiting for Wanderer in her room. In the film, they talk through a hole in the cave walls and he later hides in the wheat from her. A lot more time passes in the book. Wanderer is in there for months, but it only seems like a week or so in the film. In the book, there’s a lot more crying inbetween everything going on. The film isn’t so melodramatic. In the book, they have a garden with loads of vegetables. In the film, it is only a field of wheat. In the book, Jeb puts Wanderer in Jared’s bedroom. In the film, Ian offers her his bedroom. In the book, they take Wanderer to see Doc where he talks to her about alien medicine and treatments. Again, she doesn’t meet him until later on in the film and they don’t have many conversations together. In the book, Wanderer tells Jamie about the planet of spiders. Again, the film doesn’t detail these other worlds. In the film, Jamie shows Wanderer a cave filled with glow worms. This isn’t in the book. In the book, Wanderer accidentally tells Jamie about how easy it was to take over Earth which makes him cry. This doesn’t happen in the film. In the film, two humans die on a supply run whilst Jared and Kyle are nearly caught. We also see them taking bodies back with them. This isn’t in the book and no one dies on the run. In the book, Jeb suggests that Wanderer teach a history class to the humans where she details even more of the worlds that she has lived on. Jared and Kyle return and are furious that they are treating her like a human. She doesn’t teach any classes in the film and, again, we learn nothing about her past. In the book, Melanie tells Wanda that she doesn’t hate her anymore. The change is more gradual in the film and isn’t expressed so obviously. In the book, a helicopter does fly over but they don’t have to move the mirrors like they do in the film. In the book, we meet more of the characters in the caves including Lily, Wes, and Walter. Sharon is also there and is in a relationship with Doc. In the film, we don’t see any of the relationships that Wanderer makes with these characters since they do not exist. In the book, Wanderer becomes close to Walter. He is dying of cancer and mistakes her for Gladys, his dead wife. He later dies and they have a funeral for him, at which Wanderer makes a speech. This isn’t in the film since Walter doesn’t exist. In the book, Wanderer and Melanie discuss whether they should escape since they are in danger in the caves. Jamie says that he will protect her. He then stops Jared from attacking her by punching him in the face. None of this is in the film. In the book, Ian and Wanderer listen in on a conversation between Kyle and Doc who say that something is wrong. In the film, we don’t know that anything is going on until Wanderer sees it for herself. In the book, Wanderer kisses Jared after they have a fight because of a strong desire to. In the film, Jared kisses her to see if Melanie will react. Both situations come to the same conclusion. In the book, after Kyle attacks Wanderer, he says, “Aw, she didn’t fall.” In the film, he keeps quiet as she makes excuses for him. In the book, they then hold a tribunal to see what should be done with him. In the book, Wanderer tries to stop people calling her “It” by explaining that she is a female and detailing her reproduction process to them. This isn’t in the film. In the book, they play a game of football. Melanie falls over from being so tired and Jared catches her. Very Twilight! They don’t play football in the film. In the book, there’s a lot more fighting between Ian and Jared. Jared says that the body is his. Again, the film doesn’t dare to suggest that a female body belongs to anyone! In the film, Ian takes Wanderer outside and kisses her. In the book, they don’t kiss until later on and he doesn’t take her outside. In the book, it is explained that Jamie fell on a knife in a supply run. In the film, Jamie doesn’t go on the supply runs and it isn’t explained why he is injured. In the book, Jared hits her in the face and she stabs herself in the thigh. In the film, she only gives herself a few cuts on her arm and face. In the book, she gives the medicine to Jamie. In the film, she tells Doc to do it. In the book, when Wanderer goes on a supply run with them, they are pulled over. Wanderer tells the Seeker that she is tired and didn’t realise that she was speeding. He gives her some Awake medicine and lets them go. This scene isn’t in the film. In the book, Wes is killed by the Seeker who is trying to find Melanie. In the film, someone has been shot but we do not know who this person is. In the book, Wanderer and Jared go back to get some cryotanks. They already have them in the film. In the book, there’s another great story here about how Wanderer knows how to remove a Soul from its host. This isn’t explained in the film. In the book, Wanderer feels around inside the body’s neck and strokes the Souls back to coax it out. In the film, she waits for it to come out on its own. In the book, Lacey is rude. In the film, she is polite and thankful. In the book, Kyle goes to search for his girlfriend, Jodi, now that he knows that she can be saved. Her host, Sunny, wants to live but Kyle wants Jodi back. This isn’t in the film. In the book, they take more people to “save”. They rescue Wanderer’s Healer who still has her Soul’s memories, and another Seeker commits suicide so that they cannot rescue the body. None of this is in the film. In the book, there is a tribunal to decide on whether they want Melanie back or to keep Wanderer. In the film, it is Wanderer who makes the decision. In the book, there’s more of a focus on how Wanderer wants to kill herself to give Earth a chance of fighting back, not wanting to return to another planet because she couldn’t bear it without the people she has begun to care about, something which she has never experienced before. It seems much more irrelevant in the film. My recommendation would be to read the book if you don’t mind a bit of romance getting in the way of a decent attempt at a sci-fi, but I wouldn’t bother with the film because it misses out on everything that makes the book good. What we are left with in the film is an awkward romance and an alien take-over with little background, whereas the book has a lot more originality to it.